1 OWNER ONLY, LEXUS CERTIFIED VEHICLE, WARRANTY UNTIL SEPTEMBER 30TH 2021 OR 110,000 KM. AWD, BACKUP CAMERA, BLACK NULUXE INTERIOR, ELECTRIC AND HEATED FRONT SEATS, AUTOMATIC DUAL ZONE CLIMATE CONTROL, PREMIUM LEXUS AUDIO AM / FM / CD / MP3 / WMA / USB / AUX / BLUETOOTH / INTEGRATED SATELLITE RADIO W/ 8 SPEAKERS, LEATHER WRAPPED / TILT AND TELESCOPIC STEERING WHEEL W/ AUDIO CONTROL / BLUETOOTH AND CRUISE CONTROL,SMARTKEY W/ TRUNK RELEASE, PUSH START BUTTON, 17'' LEXUS ALLOY WHEELS, LED DAYTIME / CLEARANCE / HEADLAMP / LED FOG LIGHTS AND MORE!! ENTRY LEVEL PACKAGE. 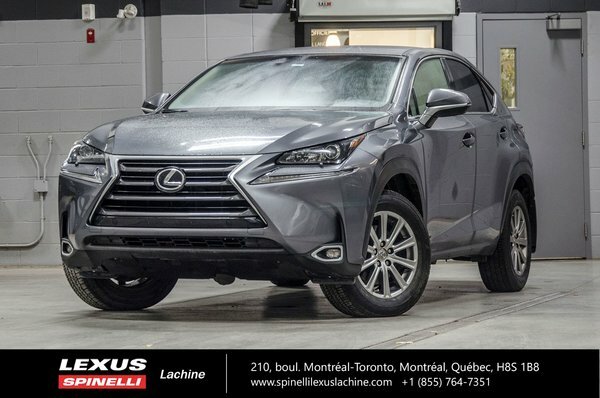 TRADE IN VEHICLE FROM A REGULAR SPINELLI LEXUS LACHINE GUEST. "The service from pre sale to the day of pick up and after sale support is fantastic"
"It is easy to communicate"